Earlier this year, hail broke the glass on the Errol Street face of the clock on the Hotham Town Hall, known variously over the years as the Hotham Town Hall, the North Melbourne Town Hall, our town hall and currently, the Arts House. Just in behind the glass are the bells of its clock which many people who live and work in the district have never heard ring. In September 1878 when the bells and the clock were about to be installed, they got quite a write up in the Argus, the Melbourne newspaper published between 1846 and 1957 (now indexed online). The clock, the Argus informs us, was Melbourne's third largest one. The first was already on Melbourne's Town Hall and the second was on the building then known as the General Post Office. We must conclude that ours was the first outside the immediate city boundary. The bells had been made to order in Glasgow. What best distinguishes them from the post office bells is the chime itself. The Hotham bells were made to ring the Glasgow chime whereas the post office bells have rung and still ring the Westminster chime, whose melody is that of London's Big Ben. They ring out specific chimes for full hours and half and quarter hours. Round the world, bells have been used to call soldiers to arms, to sound the alarm in times of flood and fire, to proclaim curfews and coronations and to signal the time to pray. Our bells simply tolled the time. In an era when few people had timepieces of their own, a highly visible chiming clock was invaluable to those needing to catch a train or get to work on time. In fact, there were complaints from the local railway when the clock was inaccurate. In the old imperial measure, our principal bell weighed 25 cwt (centum weights) which is equivalent to 1270 kilograms. Michael Fauld from Glasgow has recently sent us copies of the pages which record the original details for 'Mounting for a chime of 5 bells for Hotham Town Hall Australia'. He also sent extracts from the original work-shop diary for November 8th 1877 which notes that the casting by John C Wilson founders of Glasgow had been 'very fine' and that the full complement of bells, tongues and hammers was delivered at the end of the year and would be shipped on the 'Loch Ryan'. The records for any bells that were made from 1878 on have not survived but ours are still there and complete. 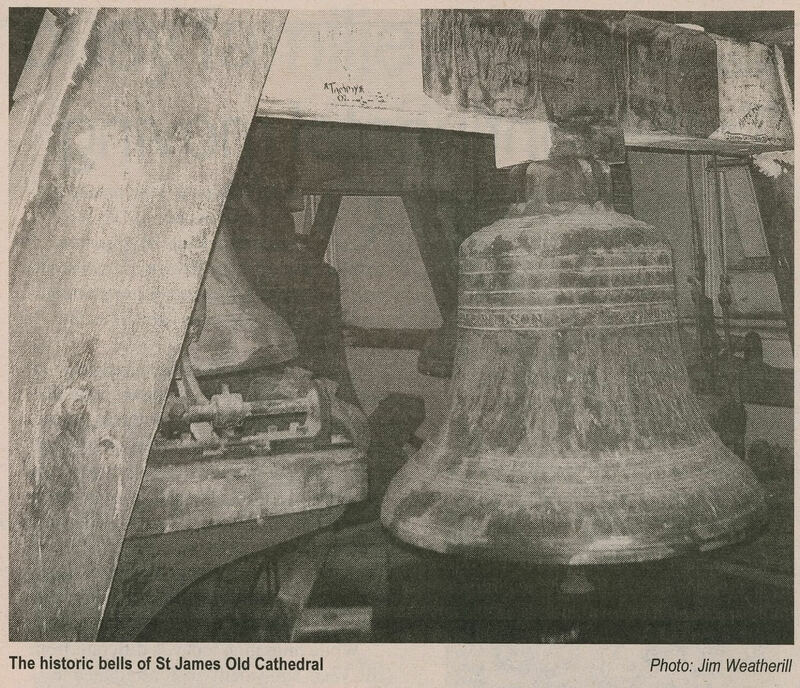 John C Wilson, bellfounder, is mentioned in an article from 'The Ringing World' journal, which explains his work and his bells. From 1854, he had run the Gorbals Brass and Bell Foundry where he first cast bells as John Wilson and later as John C Wilson and Co. A surviving page of letterhead shows that the firm prided itself on being 'Contractors to the Admiralty, War Office, India State Railways, Colonial Governments etc.' Their products were sought by 'ship builders, engineers, plumbers and gasfitters'. Wilson bells were cast in bronze and were not tuned so that some have good musical qualities and some do not. Many it seems were made for ships that relied on strength of sound rather than pitch. The Glasgow-owned ship 'Loch Ryan' with our bells in its cargo set off for Melbourne on January 8th 1878, arriving safely and in good time. The 'Loch Ryan' and other vessels of the 'Loch' company were owned by the Glasgow firm of Aitken, Lilburn and Co. The one that carried our bells was a three-masted iron ship that by 1909 had been sold as a training ship to the Government of Victoria. Later, having been sold on to the Government of Australia in 1917, the ship was wrecked on the Maldon Islands on the way back from San Francisco. One of the founders of the 'Loch' line had been a keen yachtsman who loved the sea and ships. Unfortunately, by 1917, most of the ships carrying the 'Loch' name had sunk in accidents or disappeared or been torpedoed. The 'Loch Ard' wrecked on a reef near Mutton Bird Island in the winter of 1878 was one of them. Travellers along the Great Ocean Road still stop off at the Loch Ard Gorge and discover the story of the two survivors: eighteen-year-old passenger Eve Carmichael who clung to a spar and cried for help and Tom Pearce, the eighteen-year-old crew member who dived back into the wild sea and swam out to rescue her. With such a history, we ask: why do we not hear our bells? Two of the members of the Hotham History Project are looking into the possibilities of having them ring again. The bells are in the tower and appear to be intact. With so few workable chimes in the city, it seems a pity to leave ours silent. If you have any expertise or interest in bells, you might like to join in. Please send us details of your interest or expertise through our website. by Loma Hannan, chair of the Hotham History Project, 2010.